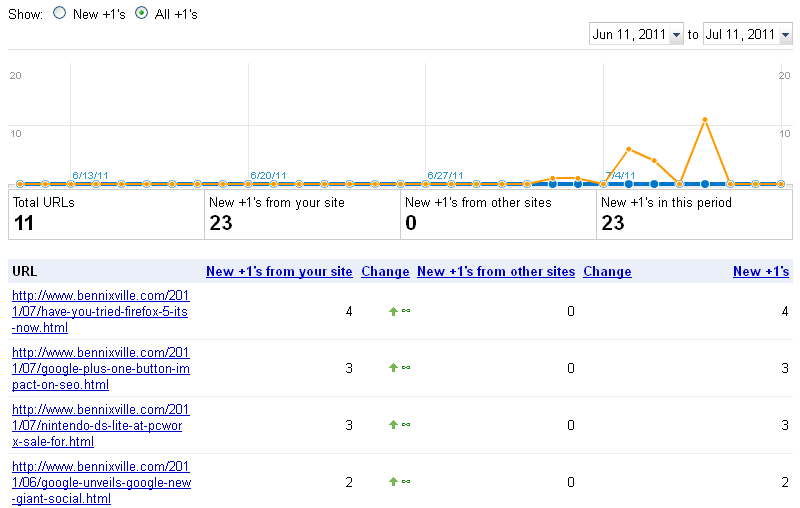 Home SEO Webmasters Guide Have you check your Google +1metrics? 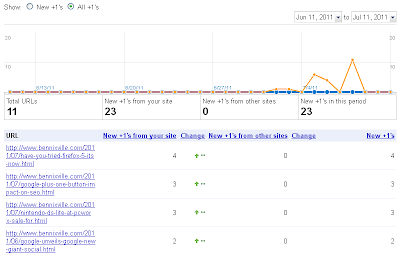 Have you check your Google +1metrics? It was almost 3 weeks ago when I implemented the Google Plus One button in this blog(bennixville) and I gradually earn few +1 points or annotations now. I am excited of what would be my score on the next month. But I don’t forced or somewhat invite anybody to press the +1 button, I just let people do it if they like. Like Google I want a natural points, no extensive efforts for convincing others.lol..
•Search Impact- This feature lists the pages on your site that received the most impressions with a +1 annotation, and allows you to see how +1 annotations impact clickthrough rate (CTR). •Audience- Display the numbers of unique visitors who hit the +1 button in your blog with respective info in their location, age and gender but all information is annonymized by Google to protect privacy concerns. • Activity-page shows you the total number of times your pages have been +1'd. You can change the date range at any time. In my Search Impact view, there was no listed pages yet. This means that not any of my blog pages has received the +1 click or annotation. This happening because the Goolge Plus One button can’t be found on any my blog pages, you will only notice it on my post not on pages. While in the Audience view I got 5 unique visitors who have +1’d my post.Thanks for them. The more 1+, the better chances to get a good SEO results from Google Plus One button.So, that’s all for now.You view your +1 metrics,cheers!